Movie started with the Joe's on a mission in Korea to retrieve a defunct which was successful. Subsequently, the President wanted the Joe's to retrieve all the nuclear missiles in Pakistan. The mission was successful and they were waiting to depart the next day. 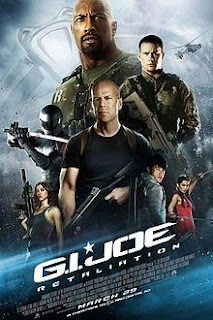 However, they were ambushed and taken down, every single Joe was killed except for Roadblock, Lady Jaye and Flint. They managed to hide in a well, survived the ambushed and returned to the US safe. However, they have to hide at Roadblock's old neighbourhood to avoid being detected. The President has painted the Joe's as traitors and enemy of the country. Snake Eyes has been caught and sent to the high security prison in Germany where Cobra Commander and Destro were held. Snake Eyes turned out to be Storm Shadow, planning to rescue Cobra Commander together with Firefly. Storm Shadow was injured and sent to a temple in the Himalayas to recover. Snake Eyes and Jinx were sent to capture Storm Shadow back so that he can answer Blind Master, of the murder of Hard Master. Slowly, everyone learnt the truth that Storm Shadow was framed. He finally agreed to help the Joe's to bring Cobra Commander down and to stop his evil plan. TBH, I watched this movie twice!!! LOL! Well, not because it's fantastically good but because of different situations (First watched with colleagues as it was company's movie night, second watched with hubby for the obvious reason). It is a good enough movie so no harm done here watching twice and fully entertained. The CGI/ action plots were good and I loved both Dwayne Johnson and DJ Cotrona so it was fun watching them. Of course, there were some gaps in the story line but then the actions stole the thunder.